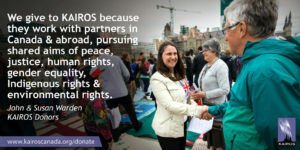 A bequest to KAIROS will support work for human rights and ecological justice long into the future. Please include KAIROS in your will. A legacy gift to KAIROS means that your commitment to human rights and ecological justice will continue long into the future. The easiest way to do this is to include a bequest to KAIROS in your will. For more information about bequests and other forms of legacy gifts, please contact Paige Jarvis, KAIROS’ Fundraising Coordinator, at 1-877-403-8933 x258 or pjarvis@kairoscanada.org.